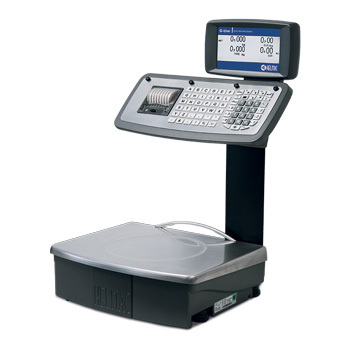 Sturdy counter scales, perfect for all applications in the retail trade and shops. The mechanical keyboard guarantees the fast and easy typing by the operator. Fast, accurate, mechanical, and waterproof keyboard, with 69 keys including 33 functional keys and 36 easily configurable for PLU's, TLU's and 6 additional operators. Thermal printer speed of 80mm/sec for normal thermal paper or for Linerless adhesive with paper 57mm wide, and outer diameter max. 50mm. System for easily loading the paper. DIE-CAST ALUMINIUM base, stainless steel and polymer structure. Stainless steel plate, 370x310mm (LxW) size. Database of 3000 PLU's, 72 with direct access. 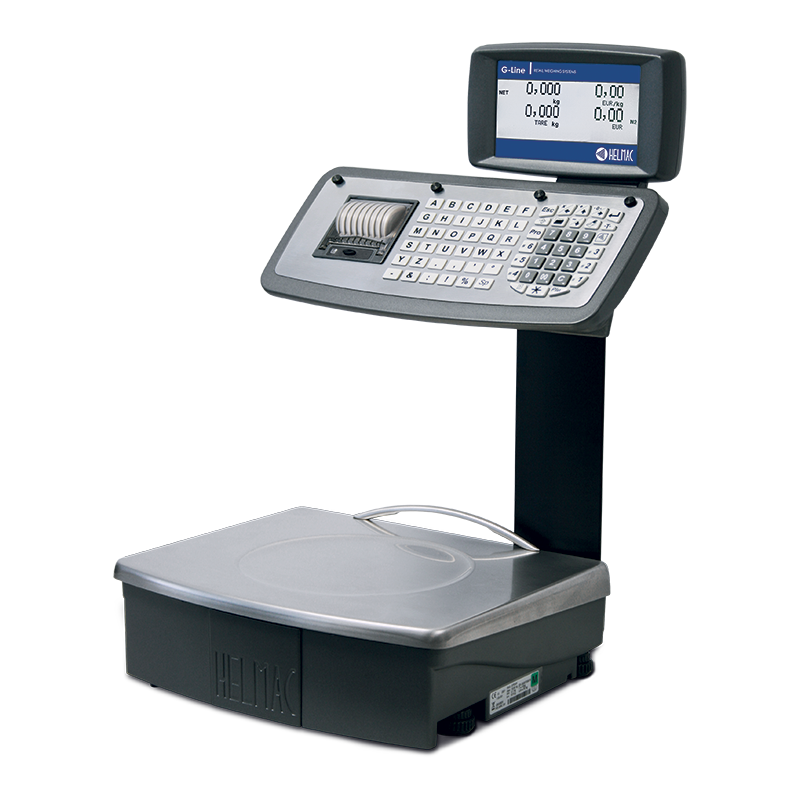 Weighing tare, operator tare, PLU's tare, pre-stored and configurable tare. Reopening of the last tickets, discounts, rebates, cash management, customer management. Management of logos and firmware with the HLL (Helmac Label Loader) software downloadable from the website. 2 RS232 interfaces for connection to PC, modem, scanner, cash register. RS485 interface for connection with up to n° 4 GPEMK scales in a local network. 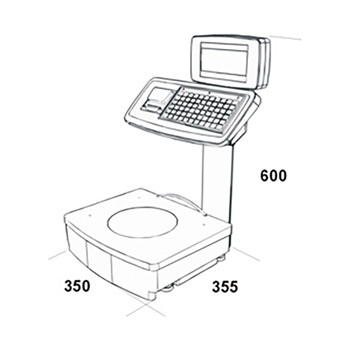 756520 GPEMK scale, 6/15kg capacity, 2/5g division, with stainless steel structure and 370x310mm plate, dual backlit LCD display on column, 69-key mechanical keyboard, and thermal printer. 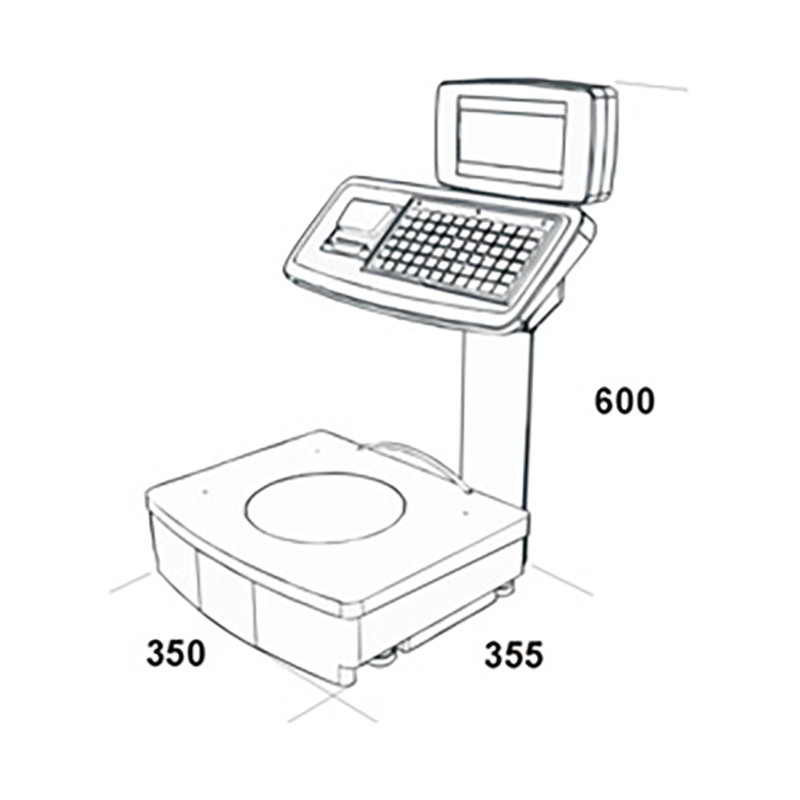 756320 GPEMK scale, 15/30kg capacity, 5/10g division, with stainless steel structure and 370x310mm plate, dual backlit LCD display on column, 69-key mechanical keyboard, and thermal printer. 756120 GPEMK scale, 12/30kg capacity, 2/5g division, with stainless steel structure and 370x310mm plate, dual backlit LCD display on column, 69-key mechanical keyboard, and thermal printer. 810116 Connection for 12/24Vdc power supply for itinerant sales. 810106 Bracket for mounting the Lynx cash register to the column of the scale.